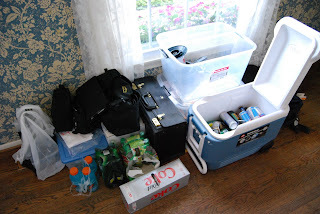 I stayed at work almost all night Monday night and then packed the car and left around 10:00 EDT Tuesday morning. 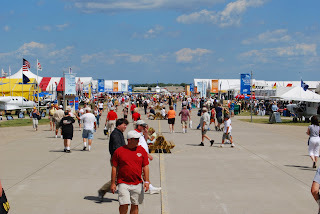 We arrived at Oshkosh around 6:00 CDT (nine hours through the Chicago construction, etc.). First order of business was to get to the Orion FBO at the far end of the North Forty for Dan Gryder’s DC-3 charity event. 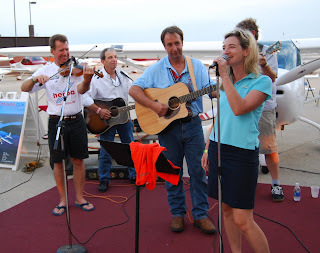 Dan was hosting the event for Challenge Air and had assembled the DC-3 All Star Bluegrass Confabulation. I got to join in on mandolin for a few numbers and Dan was even kind enough to plug me in (my mando is set up for electric, although I rarely play it that way). Cole spoke of nothing but the DC-3 on the way across the airport grounds and was really thrilled to hang out around the airplane. I think he got in and out at least a half dozen times. Here he is in the left seat. We also got a shot out on the wing. Cole seemed to be genuinely impressed that I was typed in the airplane. He’s usually pretty difficult to impress. Or maybe it’s that he gets pretty regular access to stuff like airplanes and recording studios and radio stations and other relatively cool things and just takes some of those things for granted. In any case, I think a DC-3 is pretty impressive regardless of whether you hang around other airplanes on a regular basis. We got back to the campsite around midnight and managed to set up our condo-sized tent in the dark with some assistance from some very kind EAA Radio teammates. 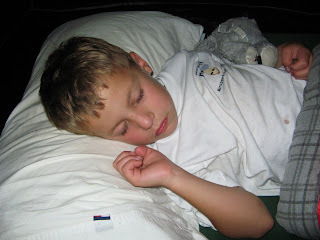 Cole was bushed and slept until 8:00, by which time the tent became a sauna and we started up the day Wednesday. This is a regular blog post. Show notes and links to audio are in other entries. 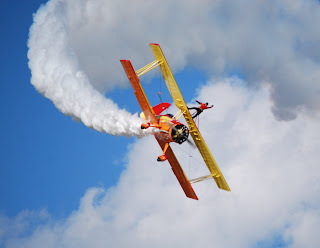 You can fly Ace! 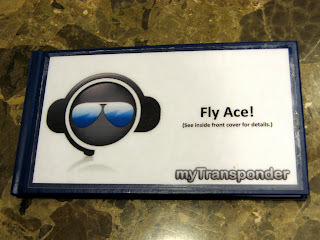 Ace is the iconic mascot of the soon-to-launch myTransponder.com, a social media site for pilots and aviation enthusiasts. 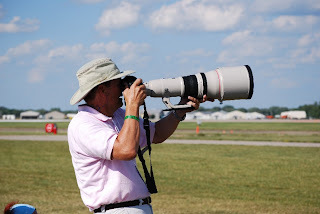 Facebook and MySpace too clunky and non-pilot-oriented for you? You need to get on myTransponder.com! When’s the last time you saw a space for type ratings in a social media profile? That and a lot more at myTransponder.com. 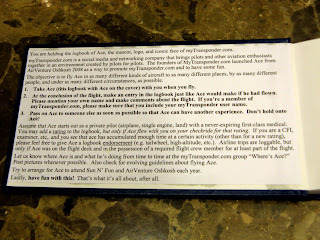 myTransponder.com has laminated Ace to the cover of his very own logbook and will be casting him to the winds at AirVenture Oshkosh this week. 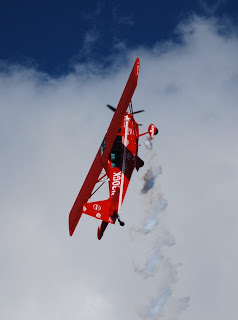 Pilots take Ace up for a flight, log the flight in Ace’s logbook, and then pass him along to another pilot. 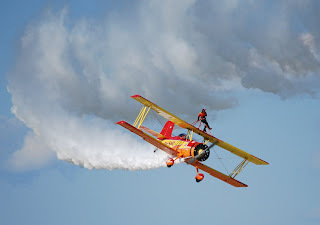 The idea is to have Ace flown in as many different aircraft, by as many people, and under as many different circumstances, as possible. And, under the right circumstances, you can give Ace an endorsement (if you’re a CFI/CFII/MEI, etc. 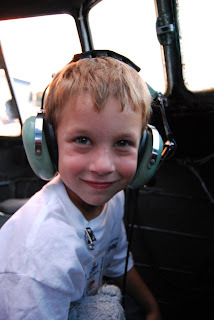 and he has the requisite experience) or even a rating (if he accompanies you on your checkride). 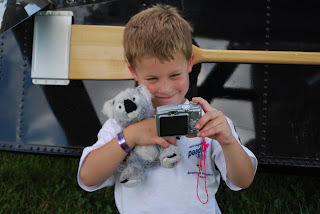 See more details in the inside cover of his logbook above. Look for Ace in your neck of the woods. 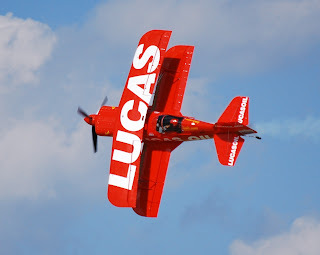 And, if you fly him, please sign the logbook and then pass Ace on as quickly as possible! 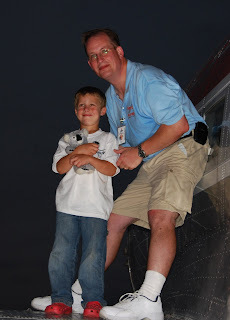 And then put an entry in the “Where’s Ace?” group at myTransponder.com so they can track him. Want an invite to the myTransponder.com beta? E-mail rod@myTransponder.com. This is a regular blog post. If you’re looking for show notes or show audio, please check the other posts. Oshkosh fever is nearing peak. I hit Target to pick up the requisite foodstuffs and Papa Joe’s for the beer (two kinds of Leinie’s and a six of Sam Adams Boston Lager for starters). 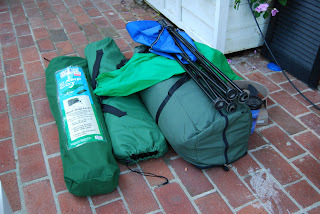 I took the sleeping bags to the Birmingham Laundromat to wash and dry them and I cleaned out the car in the Laundromat parking lot. 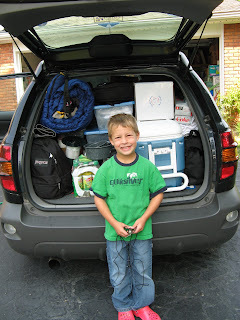 New tent, a new cot for Cole, and a pile of new equipment. And I haven’t even assembled the musical instruments that will be going with us. Dan Gryder asked me to sit in on mando for the Tuesday night DC-3 bluegrass jam. Cole and I were going to leave Tuesday night, get a hotel in Waukegan, and, long story short, arrive at OSH Wednesday morning. 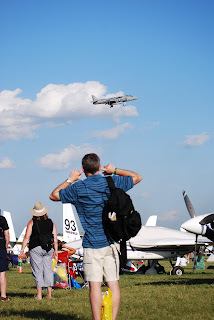 Instead, in order to make the show, I think we’re going to launch around 10:00 or 11:00 a.m. EDT on Tuesday with the idea being to arrive at OSH before 6:00 p.m. on Tuesday. Pounding out the work stuff to make sure that I can do that in good conscience. Follow me on Twitter as StephenForce. I’ll be sending out the GPS coordinates for Firebase Airspeed as soon as we get settled. We’re camping with the EAA Radio folks.